Sirloin, carrot and courgettes sauteed in honey, chili and fresh ginger. 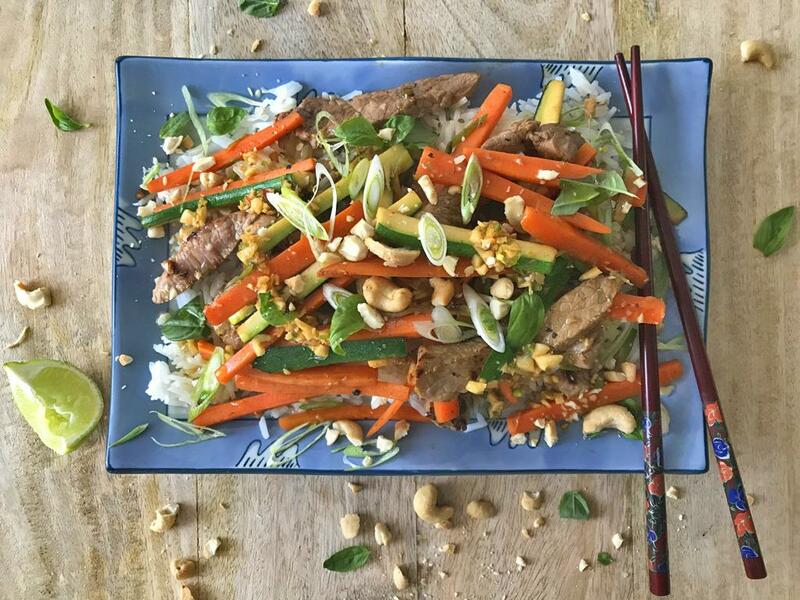 Served with jasmine rice, cashew nuts and fresh basil. Lime zest: Using the fine blade on a box grater, grate the skin of the lime to create lemon zest. Then cut the lime in half and juice. Steak prep: Slice the steak into thin strips. Using a very sharp knife, slice the steaks against the grain: this means cutting across (and not parallel to) the long parallel muscle fibres in the meat creating short fibres in each piece and delivering tender slices of meat. Sweet chilli sauce: Make the sauce by mixing these ingredients in a small bowl: soy sauce, honey, chillies, ginger, garlic, lime juice. Steak: Place a few glugs of olive oil in a large frying pan on high heat. When the pan is smoking hot, quickly brown the steak strips for about 1-2 minutes (for medium-rare). In last 30 seconds of cooking add ¼ of the sauce you made earlier. Transfer to a plate and set aside. Veggies: Place the frying pan back on the stove on medium to high heat with a few more glugs of olive oil and another ¼ of the sauce you made earlier. When hot, sauté the carrots and courgettes for about 2 minutes. Now add back the steak strips and mix well. Serve the steak strips and veggies over the rice. Dress with rest of sauce, spring onion, basil and cashew nuts.